Did we open the right coffin? 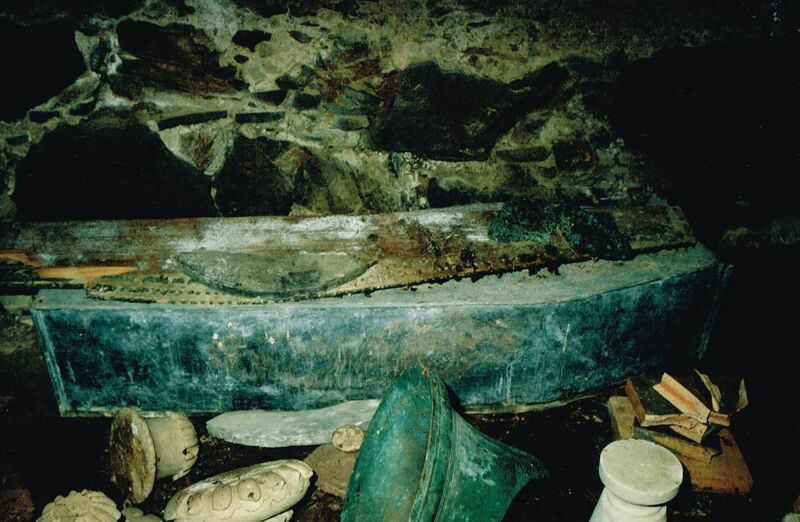 There was an interesting post from Sarah Fraser recently – did the coffin we examined belong to Simon the Fox? 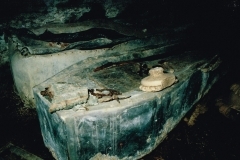 It is a double lead coffin, the type Prof Sue Black told us was used when bodies are to be transported a long distance, such as from London to Kirkhill. 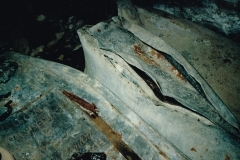 The other coffins appear to be single layer lead coffins as can be seen from the photos below. These were taken by our architect and Trustee Fred Geddes in the early 1990’s when the restoration project was being planned. General Simon’s coffin has a lead plate soldered to his coffin lid so we can be sure it is his. We also have his brass name plate from the timber outer coffin. 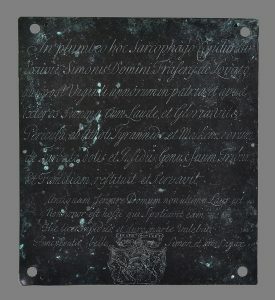 Likewise there is a plate soldered to Jane Fraser, Archibald’s wife’s coffin but no brass plate. The other 2 large coffins do not have a name plate fixed to them but we have 2 other brass plates for Archibald and his son Henry Emo. 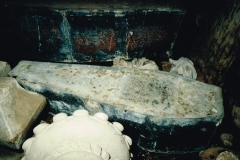 There is a shadow on the coffin behind General Simon’s of the same size as the brass plate that reads “The Honourable Archibald Fraser of Lovat…..”. This indicates that although it was probably originally fixed to a timber coffin, it has been laid on this coffin for a long period of time. 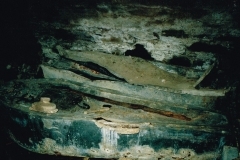 It is therefore not unreasonable to assume this is his and therefore the other coffin is Henry Emo’s resting next to his mother, although interned before her. The name plate, double lead coffin, and family tradition, all indicate that the coffin on the far left of the crypt that we opened was made for Simon the Fox. We now know he is not currently resting inside it. 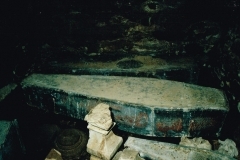 It is most likely that he is in the chapel of the Tower of London as the official record states however until that could be proved by examining the remains there, it is still possible that he was brought to Wardlaw in that coffin and at a later date moved to another location, in the crypt, graveyard or elsewhere to keep him safe from the Redcoats who occupied Kirkhill after Culloden. 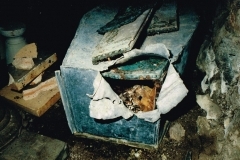 When the young lady was placed in the coffin is another mystery. Was she placed in it in London to give it a plausible weight to convince the Clan Simon was coming home? 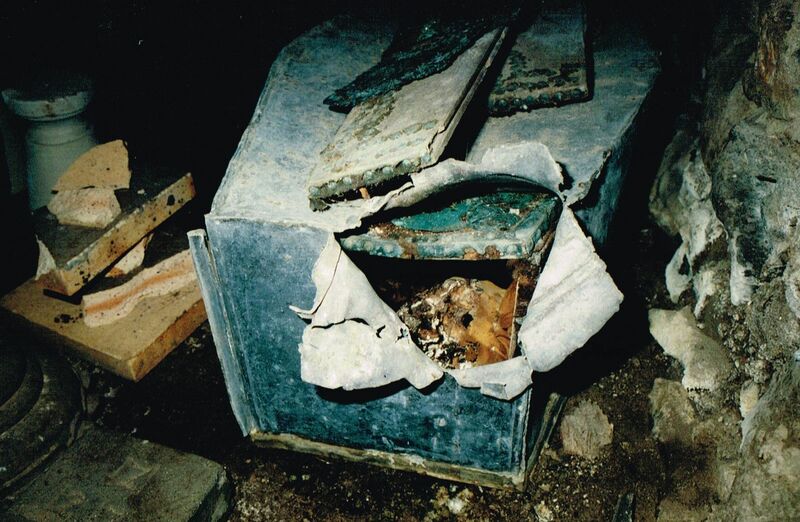 Was she placed there as a useful place to hide a body that was then transported hundreds of miles away from the scene of a crime? 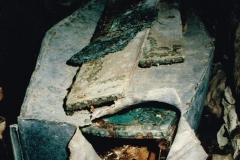 We have seen how damaged the coffin is. When did this start? 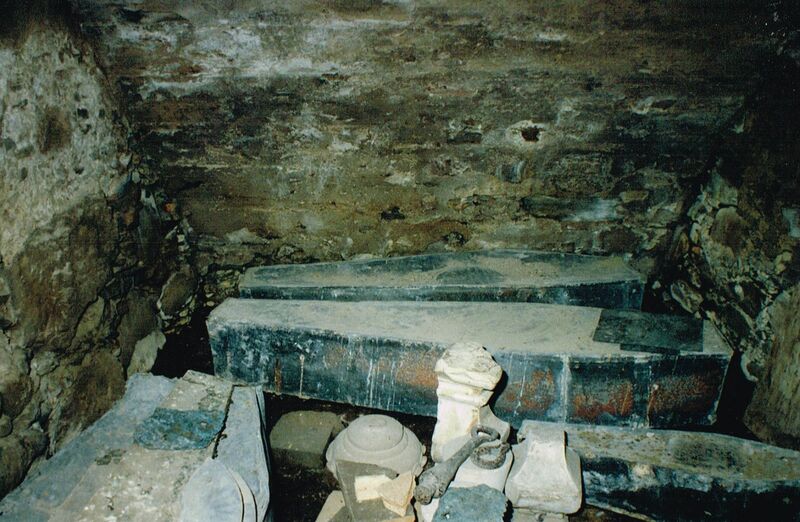 Was an already opened coffin a suitable place to lay a body in Kirkhill, a Fraser lady or just a local? 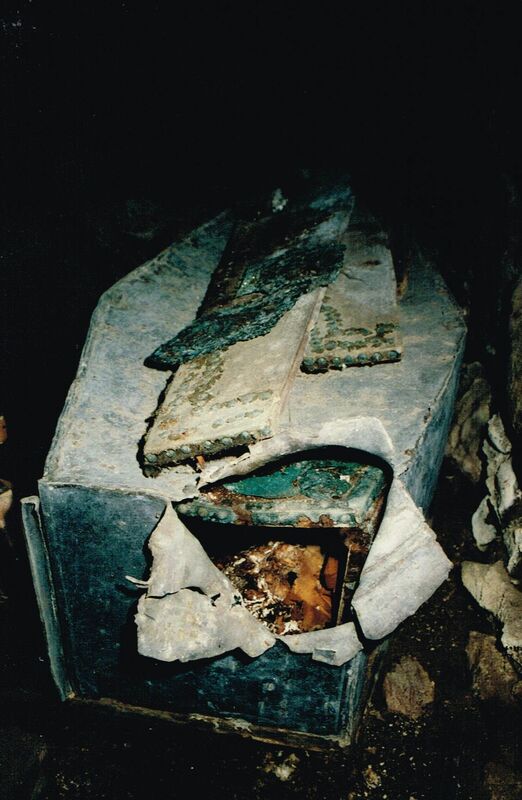 Was this an official burial or again a way of hiding an inconvenient body? If it was the former, why does she not have her own nameplate? 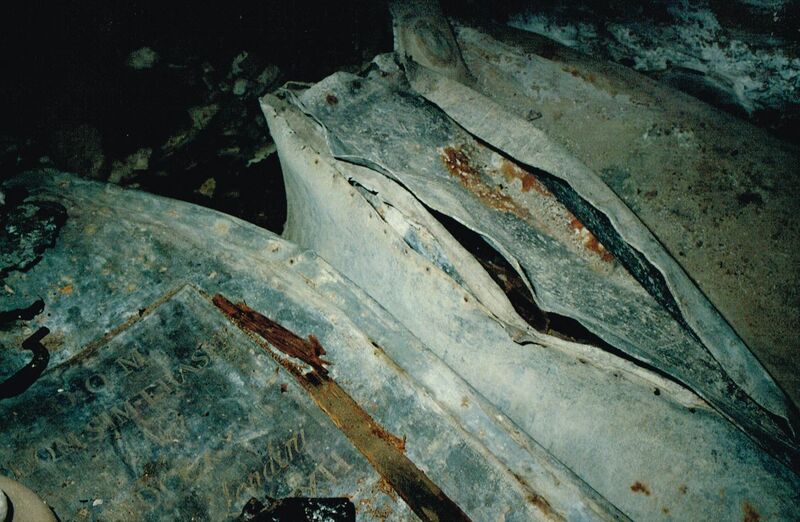 Sue also told us there were remains from other persons in the coffin, including a child. 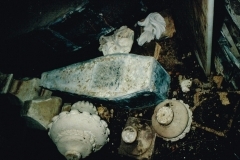 These could have come from graves disturbed by a new burial in the graveyard, ‘tidying-up’ as she called it. We have also been told by a local resident and one of our trustees that there used to be other coffins stacked on top of the lead coffins in the crypt so they could have come from them as the timber coffins decayed in the damp atmosphere. Unfortunately these were removed sometime between the early 1960’s and the start of the restoration in the early 1990’s and all that was found were a few pieces of the side boards of a few coffins. 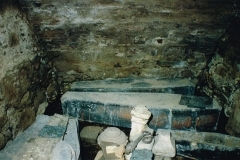 As the crypt was used by the Lovat Fraser family they could have been other members of the direct family. 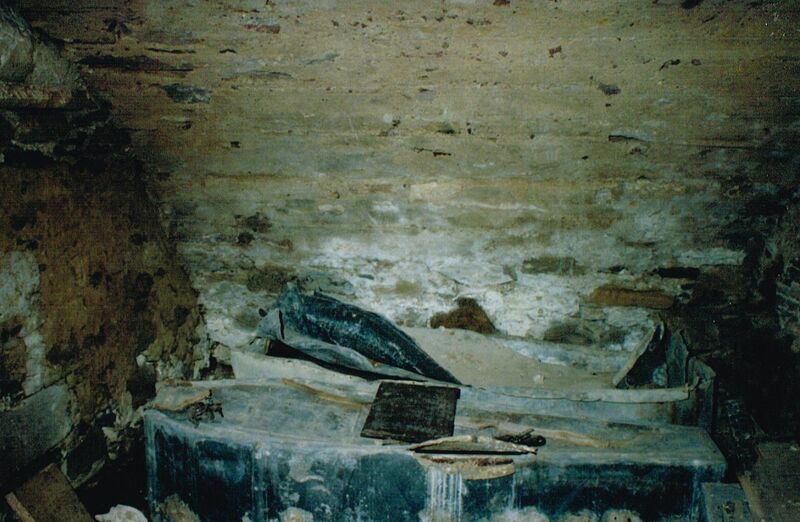 The last known Lovat coffin in the crypt is Jane Fraser in 1819. Once the Strichen Frasers took over the estate they built St Marys Church in Eskadale and have used it ever since for their family burials. If the timber coffins were added after 1819 it suggests they might have been from other local branches of the family. 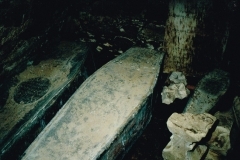 However, if the building was no longer under the close watch of the Lovat family they could also have been local residents of the parish, using the crypt as a convenient place to lay the coffin without the expense of a burial. Sadly we may never know who they were. The result of Sue’s investigations may have answered one question, “is Simon there?”, but is has raised many more. We shall continue to search for answers to these questions and bring them to you. If you can help with any information that can help shed light on them, we would be delighted to hear from you. Comment below or email us at wardlawmausoleum@gmail.com.